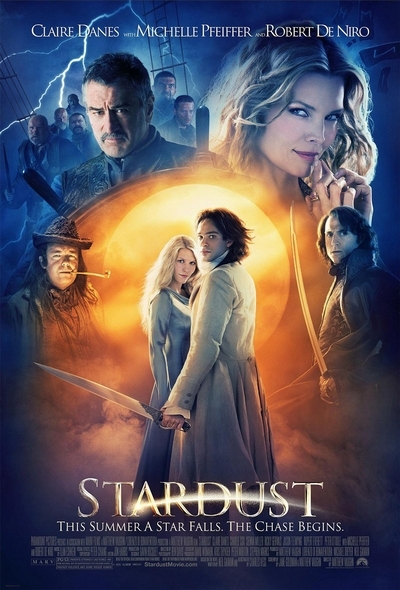 Story: "Stardust," based on the best-selling graphic novel by Neil Gaiman and Charles Vess, takes audiences on an adventure that begins in a village in England and ends up in places that exist in an imaginary world. A young man named Tristan (Charlie Cox) tries to win the heart of Victoria (Sienna Miller), the beautiful but cold object of his desire, by going on a quest to retrieve a fallen star. His journey takes him to a mysterious and forbidden land beyond the walls of his village. On his odyssey, Tristan finds the star, which has transformed into a striking girl named Yvaine (Claire Danes). However, Tristan is not the only one seeking the star. A king's (Peter O'Toole) four living sons - not to mention the ghosts of their three dead brothers - all need the star as they vie for the throne. Tristan must also overcome the evil witch, Lamia (Michelle Pfeiffer), who needs the star to make her young again. As Tristan battles to survive these threats, encountering a pirate named Captain Shakespeare (Robert De Niro) and a shady trader named Ferdy the Fence (Ricky Gervais) along the way, his quest changes. He must now win the heart of the star for himself as he discovers the meaning of true love.